“Spoiled” is perhaps a matter of opinion. But it is true that working in the architecture field nowadays is drastically different to what was like decades ago. Software developers (or as we like to call them, life-savers) have created programs and applications that have allowed us to step up our architecture game. But with such a vast number of apps out there, it can be difficult to keep up with what’s available. To help you out, here’s a list of the top architecture apps on the market at the moment. Remember how you used to have to wait until you were in front of a computer, with a CAD file open, because these drawings were not accessible on your phone? Autodesk has created the perfect solution to this dilemma by developing the Autodesk A360 app. What’s so great about A360? You can view and upload 2D and 3D drawings regardless of what software you used to create them, navigate large-scale models, review and markup the designs, measure dimensions and areas, and track the project status anytime, anywhere. The people at Autodesk believe creativity starts with an idea, and sometimes you never know when this idea might strike. It could be when you’re riding the bus, daydreaming in meetings or lectures, or in the infamous epiphany-generating bathroom. 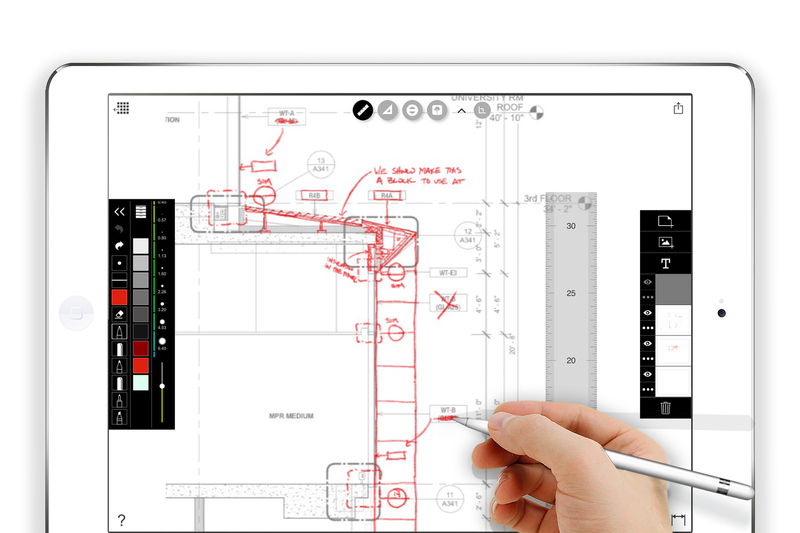 To make sure ideas are not forgotten, Autodesk developed a “superior drawing experience” with innovative tools that help you draft like a pro. Other than the pencils, markers, and over 190 customizable brushes, the application has a 16-sector Radial Symmetry and Predictive Stroke that smooths lines and corrects shapes. The award-winning BIMx possesses a unique technology which integrates 2D and 3D building project navigation. Its Hyper-model feature helps its users bridge the gap between the design studio and work on the construction site. Clients, architects, and construction builders can virtually walk through and make measurement adjustments in the 3D model without the need for installing a CAD software beforehand. Talk about on-the-spot problem-solving! Concepts app is basically a digital sketching paper, but on steroids. With its 64-bit precision and multi-threaded rendering, the app is a flexible, accurate, and extremely responsive. The award-winning app is perfect for architects, illustrators, product designers, and visual thinkers who like to explore their creativity and sketch whatever comes to mind, without forgoing the details. A veteran in the Archdaily “best apps” lists, Morpholio is a dream software for architects and designers. The application is a unique drawing tool which allows its user to work fluidly through all the design process. Other than having the ability to sketch, draw, and develop ideas with precision, the app allows markups on pdf files and images and is continuously adding new features to make the design process a lot easier—including a recent addition that adds augmented reality to its repertoire. A limitless measuring app, Scala Architectural and Engineering Scale provides you with accurate measurements to a printed drawing of any scale. The simple, easy-to-use app includes architectural, engineering, and metric scales, and can provide dimensions, even if the scale is unknown. The name says it all. The Sunseeker application provides an augmented reality camera with a flat view compass to track the solar path, its hour intervals, rise-set times, and winter and summer solstice paths. Among its many features, the app uses GPS and magnetometer to find the correct solar position and path for your current location, ability to choose location on Earth, and details including the maximum sun elevation. The application is not only ideal for architects, but is also suitable for photographers, real estate buyers, solar panel buyers, gardeners, and sun lovers (taking tanning to a whole new level! ).